Unique job hunting advice for the new economy, told with personal anecdotes and real stories: more like chicken soup for the job-seeker than a dry reference manual! Quillen's book alone teaches readers how to do that, by providing insights into the thought process of hiring managers and HR Directors -- because he has been one most of his career! Using stories and anecdotes throughout, all from his 20+ years of personal experience and as a very recent job seeker himself, his credentials are better than anyone else writing on this subject. Ten or fifteen years ago, a well-crafted resume got you interviews and a job. But now, in the horrific "New Normal" economy where real unemployment is more than 16%, you absolutely have to tailor your resume specifically to each job for which you are applying. If you don't, less-qualified candidates will get the interviews, and you'll be left out in the cold. This is just one part of the new job-seeking world that author Dan Quillen reveals from personal experience. Laid off in 2011, Dan was part of two networking groups...their average interviews per resume submitted was something like 5% -- one in twenty. Dan's was 24% -- nearly one in four. 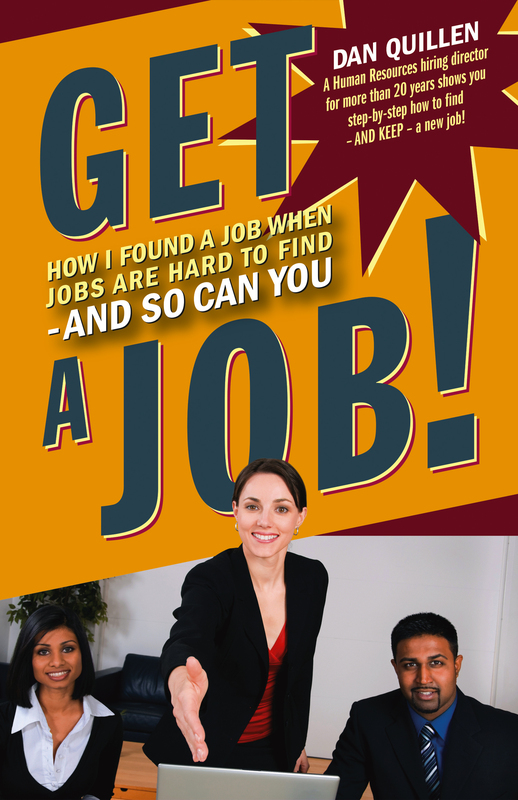 Dan got a job in record time, and now he shows readers how to do the same in Get a Job! Rather than a cold impersonal litany of things to do, Get a Job! is more like sitting down with an old friend who has taken a personal interest in the job seeker’s dilemma. Quillen takes his readers by the hand and guides them through all the critical steps necessary for finding a job today -- not twenty years ago. Along the way, Quillen shares his own personal experiences in finding work in today's difficult economy, seen through the lens of his decades of HR experience as a hiring manager and HR director. The use of the Internet and social media is an important component of this book, which is filled with examples from Dan's own job hunt. Featured are copies of his resume (reviewed and discussed section-by-section), the job boards he used in his search and how best to use them, first steps to take after being laid off, the importance of resumes and cover letters, overcoming gatekeepers, preparing for the interview and how to excel at one, temp agencies, age-related questions, and much more. Dan also provides great strategies on how to keep a job once you've landed it, how to prepare to leave if the job appears to be ending, and how to stay positive in a very negative time. Real examples from Dan's search are the hallmark of every chapter, every strategy offered to readers. Book Cover Image (jpg): Get a Job!